11/7/2016 | MIHARA Ken — dai ichi arts, Ltd.
His name is not Richards Serra and his medium is not iron, but Mihara Ken gives us an organic, spiraling maze that calls to mind the American sculptor's dramatic, encompassing works. His unique style is the culmination of a thoughtful dialogue between potter and clay. Using materials from his native Shimane prefecture, Mihara constructs each work though an organic creative process that begins with forming the works by hand. His works possess a strong linear quality and yet incorporate soft, delicate curves in a unique combination of subtlety and solidity. His elegant shapes are drawn from ancient forms or, more currently, inspired by the tradition of origami. The works are fully sculptural and shine from every vantage point. This spiraling piece provides a unique form from each angle, constantly changing as the viewer moves around the work. He achieves soft, subtle colors ranging from deep gray to peach to misty white and purple through multiple firings at high temperatures. The resulting surfaces are radiant. In his own works: "After the shaping is done, the piece is fired for 12 hours at low temperature, and then I cover the surface with fire-resistant clay. After that comes the real firing at high temperature for 40 hours. The clay covering does not shrink much, so it peels off like the shell of a boiled egg." By covering a work with clay, the piece does not get any ash-glaze from the direct fire. 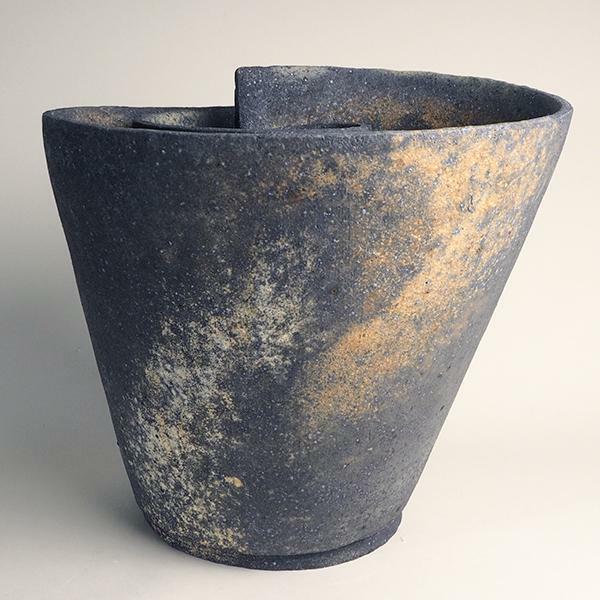 As a result, the surface ends up having the texture of an old clay vessel with high durability. This gorgeous result has made Mihara's pieces highly sought-after. His work can currently be found in the collections of the Metropolitan Museum of Art, New York; the Brooklyn Museum; the Museum of Fine Arts, Boston; the Philadelphia Museum of Art; Yale University Art Gallery, New Haven; the Chazen Museum of Art; Los Angeles County Museum of Art; the Victoria and Albert Museum, London; the Museum of Ceramic Art, Hyogo; and the National Museum of Modern Art, Tokyo; among many others. Japan has traditionally searched for beauty within wabi-sabi austerity, spiritual simplicity, and the cherishing of patina. In keeping with this tradition, Mihara's works call to mind the spiritual aesthetics of ceremonial vessels, such as ancient bronzewares. His Zen-like tranquility produces a feeling of silence and power, through which the artist listens to his own inner voice and to the unique voice of the clay.